Audi origins date back to the early 1900’s with a modern relaunch in the mid-1960’s after Volkswagen group purchased the brand from Daimler-Benz. Audi’s original founder, August Horch, gave the luxury brand its namesake. “Horch” means listen in German and listen translated into Latin is “audi” and that is exactly what Audi does, they listen to what consumers want in luxury vehicles and then they deliver expectation exceeding results. Thanks to their intuitive technology and exceptional exterior styling used Audi vehicles are a hot commodity on the market but here at Barlow Motors we see a steady stream of used Audi vehicles into our inventory. 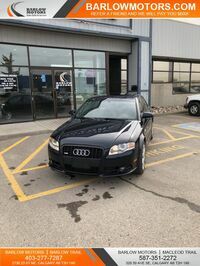 Find out how Barlow Motors in Calgary, AB can get you into the driver’s seat of a used Audi vehicle easily and affordably below. Where Can I Find a Used Audi Near Me? With an ever-changing inventory of used Audi vehicles Barlow Motors is the first place to start your search for the Audi that you seek. Late model used Audi vehicles at Barlow Motors have powerful and responsive engines that deliver an exciting driving experience while the interiors get loaded with first-class finishes as well as advanced technology equipment for a comfortable and connected ride across town or across the country. 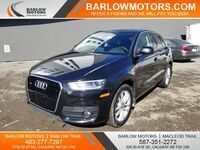 Barlow Motors also makes it easy to find the used Audi you are looking for thanks to our real-time online inventory that can be sorted by body style, engine, or even exterior color. Pinpointing the exact Audi that you desire is easier than ever before and can be done from the comfort of your own home. At Barlow Motors website there is also easy-to-use finance tools that allow shoppers the ability to assess their current cars trade-in value as well as apply for online credit approval. Barlow Motors also understands the importance of reliable transportation and that is why we specialize in helping customers with less than stellar credit find financing that fits within their budget. You can find the used Audi that is perfect for you by browsing our online inventory or by stopping into the showroom and speaking with one of our helpful staff members. Interested in a Audi Vehicles?